Last week, I was invited to kick off the start of Wellington City Council’s Our City Tomorrow speaker series. The lineup’s amazing, and meant to get people thinking about the next 2–3 decades and what they could / should mean for Wellington city. Below you’ll find my slides, a video of the full evening (see the caption for who speaks when), and my notes themselves as the blog post. Warning: it’s not an exact transcription of my talk as I, er, tend to extemporise a bit when talking. Also, there’s an easter egg for those of you who get all the way to the very bottom (hint: it’s exciting news). Note: if you’d like the slides themselves transcribed as is (they’re very light on text), please let me know — contact details at the bottom of the post. 00:00 David Chick (Chief City Planner, WCC). 4:04 Mayor Justin Lester (Mayor, WCC). 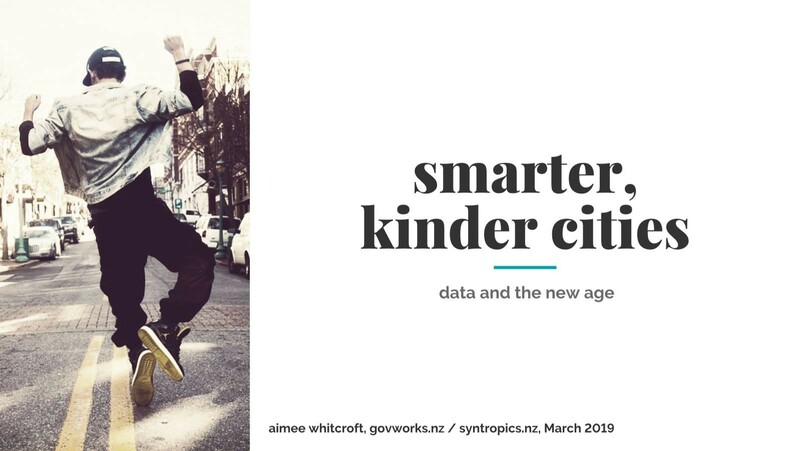 8:52 aimee whitcroft (Govworks NZ / Syntropics NZ). 28:36 Jessica Manins (Mixt). 46:38 Tea break. 55:42 Hiria Te Rangi (Whare Hauora). 1:12:52 Tim Packet (BucketLabs). Watch the video on Facebook at https://bit.ly/2W0Odmk. Kia ora all! I’d like to thank Sean, Clare, Diane and the City Council for setting up this amazing speaker event series. As we’ve heard, District Plan reviews happen just once a generation — the current plan was written in the mid 90s, and we know how much has changed since then! 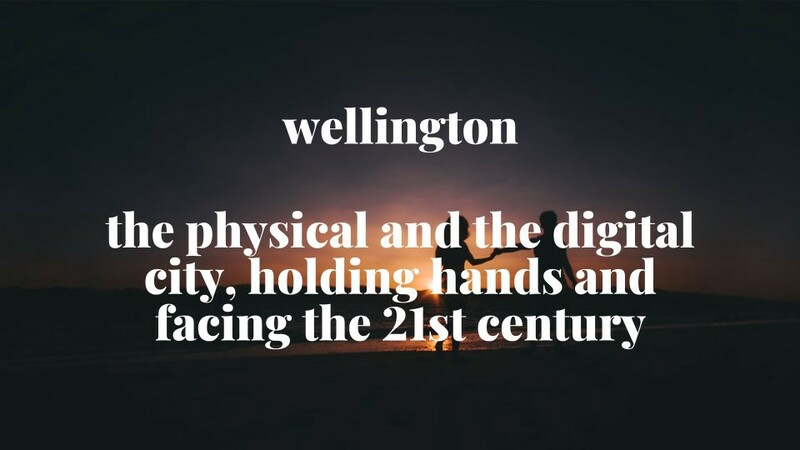 And so I’m tremendously glad to see how dedicated the Council is to making sure every Wellingtonian is part of this one, and is thinking seriously about and talking with people about what the next few decades could bring to our city. I’m going to keep my talk quite brief, so that we have time for questions and, I hope, the start of some great kōrero, and plans for positive action. 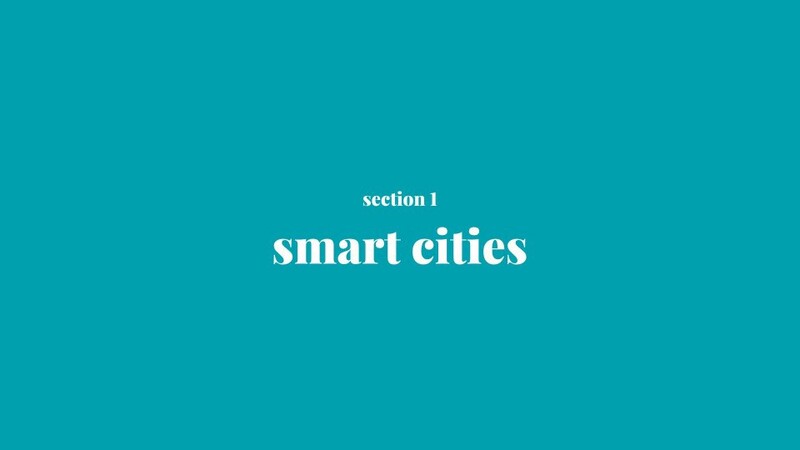 I’ll discuss two topics which I believe could be tremendously powerful forces for good in our city in the coming years, if we’re thoughtful about them: smart cities, and civic technology. Smart cities are a hot topic at the moment, and that’s only going to increase. They’re defined in all sorts of ways — often the sign of a new movement going through a Cambrian explosion-type event. 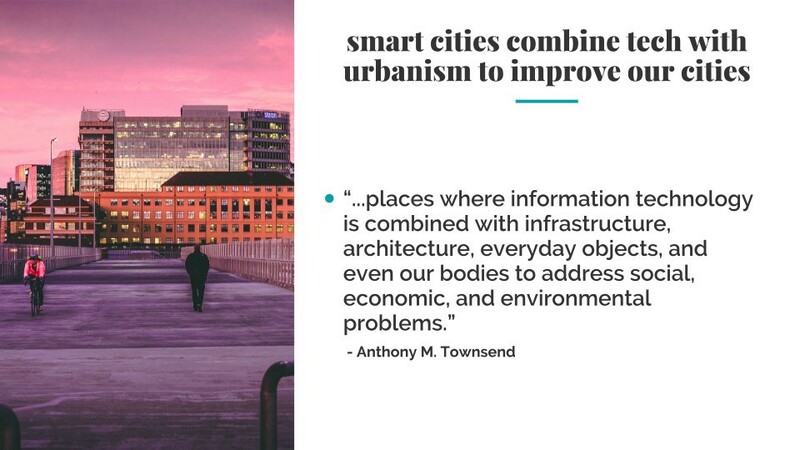 For the purposes of this talk, I’m going to quote Anthony M. Townsend’s definition of smart cities as “places where information technology is combined with infrastructure, architecture, everyday objects, and even our bodies to address social, economic, and environmental problems”. At the moment, much of the focus is on using Internet of Things technologies like ubiquitous sensors and cameras, combined with big data analysis, to help improve the efficiency of cities. Much of the coverage is very positive, and it’s an exciting idea — using technology to help improve our day-to-day lives. Certainly, large tech companies are enthusiastically pushing their ability to help cities across the world implement these sorts of systems. So I’m going be a bit contrarian, and suggest that — like implementing AI — we think carefully _before_ enthusiastically leaping into a brave new constantly-monitored and surveilled world. As with cars in the early twenty-first century, where we completely refactored our urban spaces and societies to fit around them — and have been suffering the consequences ever since — fundamental changes to our cities can be positive _and_ negative. 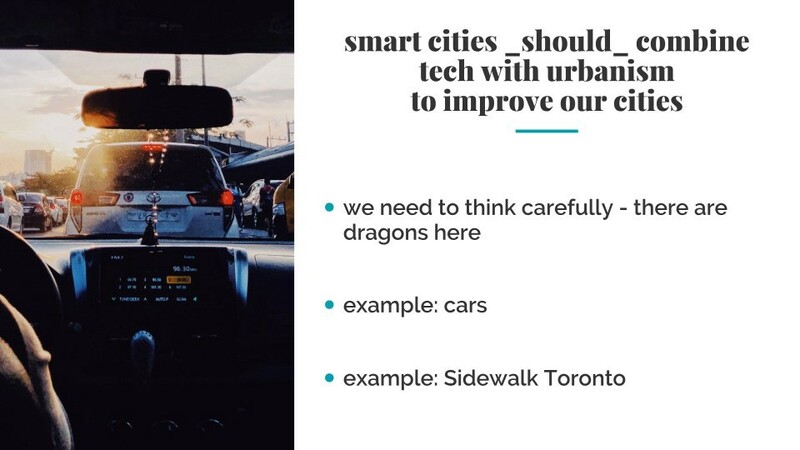 There are certainly plenty of negative examples — a recent example that springs to mind is the disastrous Sidewalk Toronto smart city project, being run by Sidewalk Labs (an Alphabet initiative) and Waterfront Toronto. It’s a brilliant cautionary tale of how _not_ to do things — and there are plenty more. 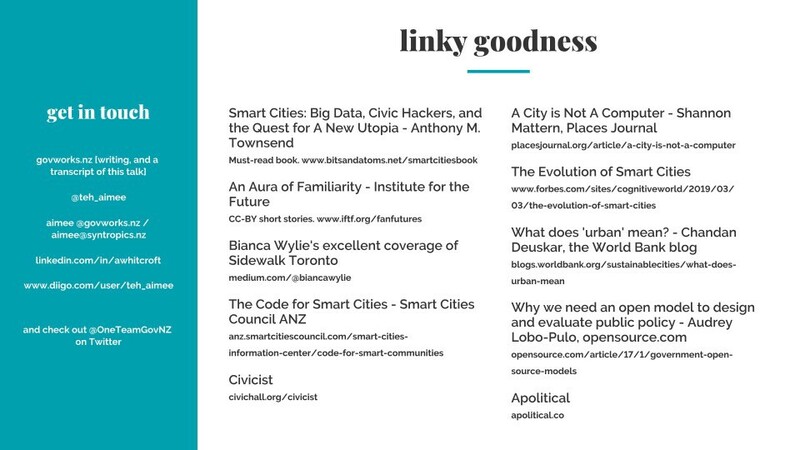 So, what should _good_ smart cities implementation look like? It’s vital (and you’ll hear me say this again later) that we put people before technology. The tech should _serve_ the people who live in and around the city. We need to be very careful of cool shiny new toys. We need to use a mixture of skill sets in her development: yes, we absolutely need traditional urban planning. And, as we start to think about the ‘digital city’ — not just the physical city — we need to involve technologists and scientists. But we need far more. We need community leaders. We need people who work in the humanities, from librarians to ethnographers to philosophers to to historians. We need you and me. And it’s absolutely vital we involve our young people — they’re going to have to live with the decisions we make, and this desperately needs to not be another climate change situation. We need to sit down, together, and think very carefully about the possible unintended consequences of any decisions we make. How could our decisions potentially harm already vulnerable people, or ecosystems? What effects could we have on our environment? How will this help us adapt to climate change? What, quite literally, are the costs, benefits and downsides, and who decides how those are balanced? [I believe it should be all of us.] And what’s going to happen to all these mountains of data? What are the privacy implications? Are we collecting data unnecessarily? As another writer has put it: cities aren’t computers. 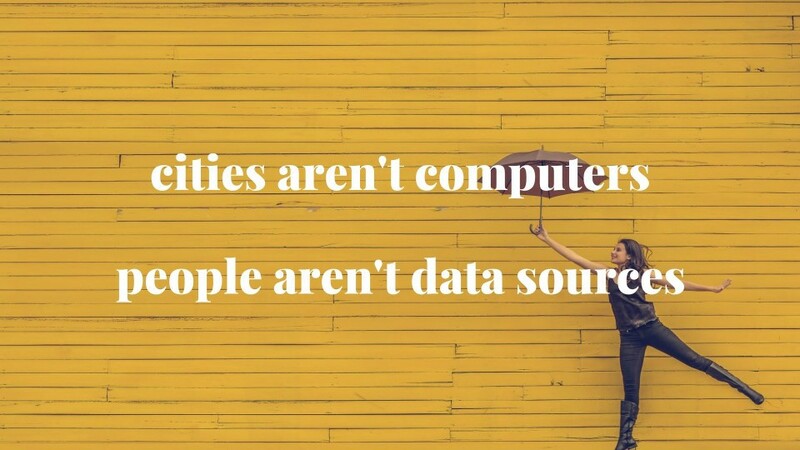 And people aren’t data sources. Let’s make sure we have tech that works in service of our communities — not the other way around. Let’s build something great in Wellington. 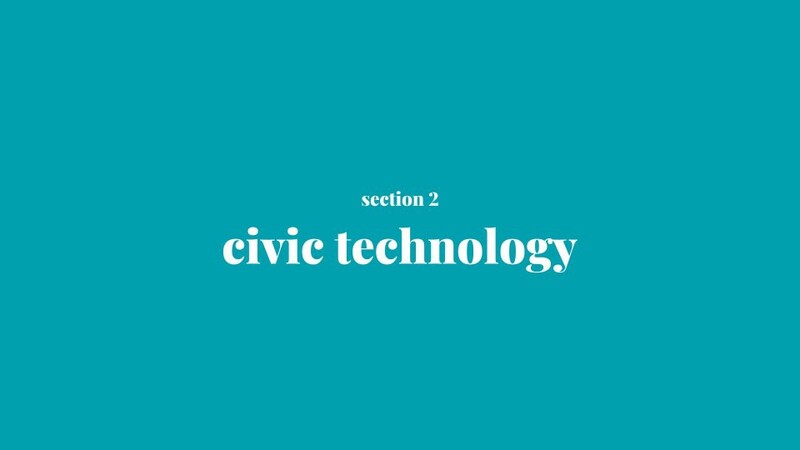 Talking of tech serving communities, I’d like to chat briefly about civic technology. It’s also a relatively new movement — perhaps a decade or so old — with increasing numbers of people globally involved with it. 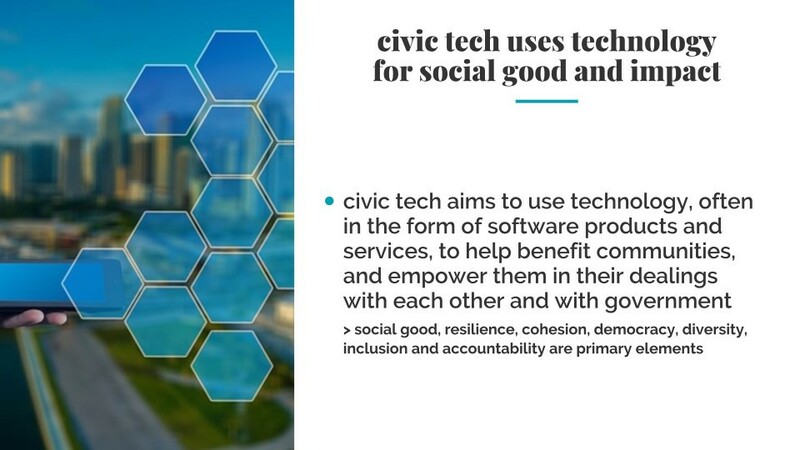 The idea’s simple: to use technology, often in the form of software products and services, to help benefit communities, and empower them in their dealings with each other and with government. Social good runs through its very core and it has a wide volunteer and NGO base, often including technologists who’re keen to give back. Which is why I’m all over it, at least. I can think of very little more important, in our increasingly-crumbling societies, than working to improve resilience, cohesion, democracy, diversity, inclusion and accountability. The upsides are enormous socially, economically and environmentally, not to mention all the warm fluffy heartfeels it causes :) And sometimes, I think we all need some positivity in our lives, eh? It’s a way, to put it differently, to help rebuild some of the social infrastructure which has been so neglected, in so many places, for so long. A powerful middle layer between individuals and our Council, working to help empower people and influence government. Open North in Canada springs to mind as a civic tech organisation doing stellar work with government and communities, and they’re one of hundreds (thousands?) of such groups. International group Luminate, as another example, is looking to invest around $60 million in 2019 alone on grants and investments in civic tech organisations and work. It’s one thing to talk about it, of course. It’s another thing entirely to get it going, and to _keep_ it going. 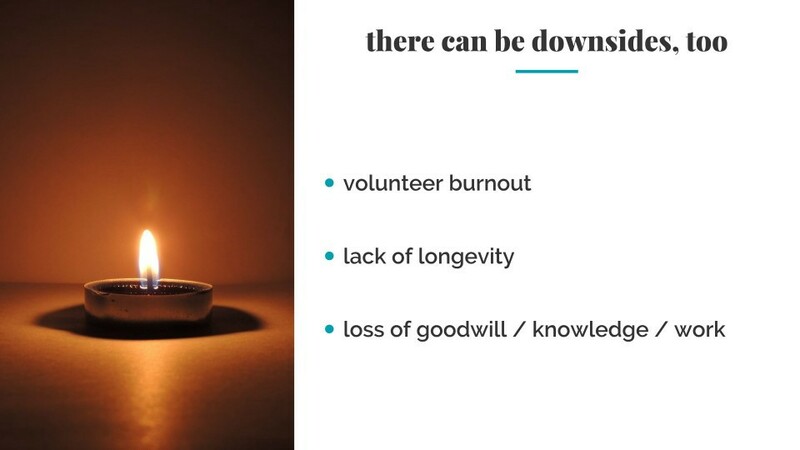 Volunteer burnout’s an issue. One-off projects are set up and run, but lack of follow-through means that much of the knowledge and good will generated are lost, as well as what was actually prototyped or _built_. And because the movement’s still new, there’s still a lot to learn as people try to figure out what works, and what doesn’t. 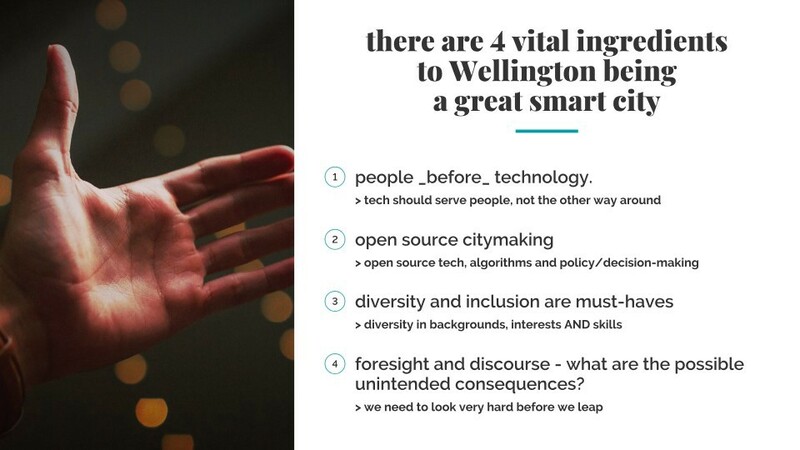 I’d really like to see a sustainable civic tech community kick off in Wellington. So here are three starting points for how to actually get this going. People who’re interested identify each other and figure out how to keep in touch and meet. Regularly. 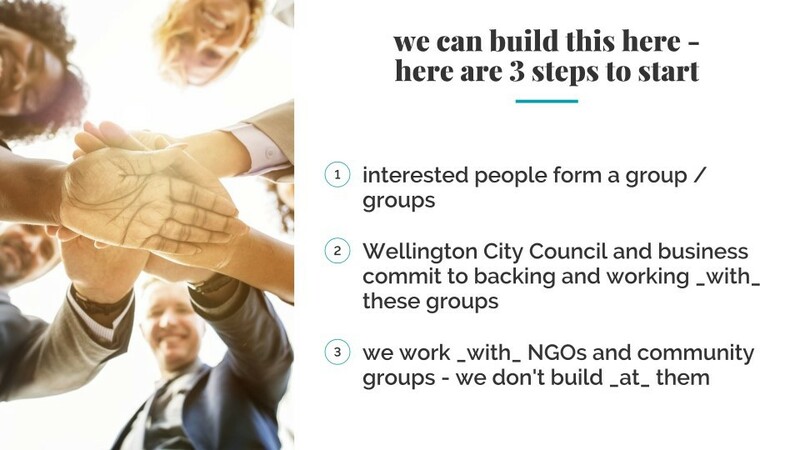 Wellington City Council and interested businesses — and it would be great to see the private sector contribute to social good initiatives like this — commit to financially supporting civic tech groups, and to actively working _with_ them. We reach out to NGOs and community groups and actively, and on an ongoing basis, work with _them_ help address the challenges they see and contend with daily. So yes — a brief talk, as I mentioned. While one can easily see a future where civic tech groups form to fight back against smart cities initiatives, I think we have a chance to do something incredible: to have the two as utterly complementary parts of building an extraordinary city over the next 30 years: one that builds smart, self-determined humans, that works for _all_ the life that lives in and around her — human and non-human — and that stands as a local and international beacon to urban planning done well: the physical and the digital city, holding hands with each other and facing the 21st century. Thank you. And thank you to all the folks who shared their thoughts and feedback with me in preparing this. I’d love to hear from y’all if you’re interested in any of the above. I’m also in the process of scoping setting up an online space where public servants and the communities they serve can interact directly with each other — let me know if you’re interested in that, too! Please do get in touch if you’ve any thoughts or questions about any of the above, or about anything else for that matter — I _love_ chatting with people. Easter egg time! Possible +10 unworthy self-link but as of April / May 2019 I’m leaving Stats NZ, so I’m on the lookout for new opportunities :) Know of something? Interested in talking? Let me know! Blog (well, one of them): govworks.nz [ie this blog]. Email addresses: aimee @govworks.nz / aimee@syntropics.nz. [Some of] my growing bookmarks list, all annotated and whatnot: www.diigo.com/user/teh_aimee.